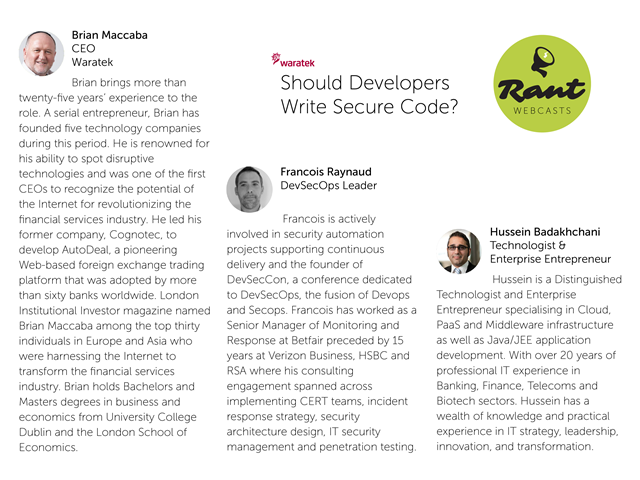 Should Developers Write Secure Code? •Should Developers focus on business functionality at the cost of security? •How much of an application is actually written by your Developers? •How do you secure your application if you can't guarantee the security of the code? Brian Maccaba, Hussein Badakhchani & Francois Raynaud. Title: Should Developers Write Secure Code? Presented by: Brian Maccaba, Hussein Badakhchani & Francois Raynaud.